Behind a 16-steal night for Adams State and a second half in which they scored 50 points, the Adams State men pulled away for their 16th win of the season and 16th straight at Plachy Hall, topping Rocky Mountain Athletic Conference (RMAC) foe Western New Mexico, 81-63, Saturday night. Now 16-4 overall and 12-4 in league play, Adams State remains firmly in third place in the RMAC race, two games up on Nebraska-Kearney and still two back of No. 5 Colorado Mines and one behind No. 12 Metro State. Only the Orediggers have put up a better record in their last 10 games than the Grizzlies 7-3 mark. Western New Mexico’s loss drops the Mustangs to 8-13 overall and 8-9 in the RMAC, tied alongside both New Mexico Highlands and Chadron State for seventh in the conference race. A close first half that saw the Grizzlies up by just one, 13-12, broke wide open as the Grizzlies recorded five of their 10 first half steals in a seven minute span. Those five steals were turned into seven ASC points, and with three minutes and 20 seconds left, the Grizzlies held a 28-14 edge. But the Mustangs hit on 3-of-4 field goals, including a 3-pointer from Juan Suarez, and trailed by just seven at the break thanks to a buzzer beating lay-in from ASC leading scorer Jack Osborn (Hobart, Tasmania, Australia), who scored 11 of his 18 before intermission. WNMU’s momentum carried over into the second half, and with 15:24 on the clock the Grizzlies found themselves trailing, 38-35, following a 3-pointer from Mustang’s leading scorer Lucio Luttrell, who scored 17 in the game. The Grizzlies, however, would waste little time in erasing their largest deficit of the game and only deficit of the second half. Junior Kaimyn Pruitt (Los Angeles, Calif.) tied the game back up with a layup and one, and another layup and one on the Grizzlies’ next possession from senior Shayar Lee (Phoenix, Ariz.) put ASC back in the lead. Luttrell would cut the lead back to one, but another Adams State layup and one, this from senior Marqus Richards (Los Angeles, Calif.), was sandwiched between a pair of triples from senior Deray Wilson (Anchorage, Alaska), and the Grizzly lead was right back to 10 points with 11:27 left. Western New Mexico would make one last run to get to within four points of ASC at 59-55 with 7:22 to play, but missed field goals on the next six possessions, including five times from 3-point range, would allow the Grizzlies to pull away for good. The Grizzlies were forced to play the final 5-plus minutes without leading scorer Osborn, as he was whistled for five fouls in the second half after not recording one in the first. Richards was close behind Osborn with 17 points, and also led the Grizzlies with a dozen rebounds for his third double-double of the season. 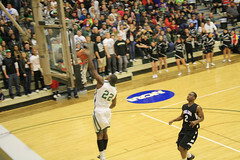 His effort on the glass led a huge advantage for Adams State on the boards, with 45 caroms to WNMU’s 27. Lee was good for 14 points, and matched his season-high with seven rebounds. Senior Jamiko Verner (Denver, Colo.) continued to lead the defensive effort, swiping four of the Grizzlies 16 steals in the game, keeping on pace with his Division II leading average of 3.8 steals per game. Pruitt swiped three and four Grizzlies each picked two. Verner was also one of four ASC players with three assists in the game, as the Grizzlies dished out 17 as a team in the game. Grizzly fans can catch a tape-delayed television broadcast of Saturday’s men’s game next Saturday, Feb. 11, on KSPK-TV. The game will be televised beginning at 6 p.m. with the women’s game followed immediately by the men’s. The Grizzlies will embark upon their second 4-game road trip of the 2012 portion of the season next weekend, heading to the UC-Colorado Springs on Friday and then Colorado State-Pueblo on Saturday.